Plan NOW To Leverage "The New Year Effect" - Coach & Grow R.I.C.H. Have you decided yet how you’re going to leverage “The New Year Effect”? As I’m sure you know, the beginning of a new year is a time when people naturally focus on making a fresh start, setting important goals and going for the things they most want to achieve. How are you going to leverage The New Year Effect in your business? Successful business owners are masters at keeping their name and their business on people’s minds. Send a heartfelt holiday greeting and be sure to include something of value that relates to your coaching and specialty. For example, you could include a goal setting worksheet, a Top Ten List about keeping New Year’s Resolutions, an article or report that you’ve written, an invitation to attend a free teleclass or webinar, or a gift certificate for a complimentary coaching session. It is smart to thank customers for their business around the holidays. This can be a small gift, a nice hand-written note or a bonus coaching session. Clients appreciate the acknowledgement and it’s an easy way to add value. Here are some gift ideas: bubble bath, herbal teas, an inspirational daily calendar, candles, a copy of your favorite book or CD. And for those “hard to buy for” people, you can’t go wrong with a gift card. As I’m sure you know, it is much easier to sell to a former customer than it is to find a new one. The holidays and new year are an excellent time to reconnect with past clients. Consider giving former clients a complimentary “New Year Goal Setting” coaching session. A percentage of them will likely begin coaching again. Or give former clients a gift certificate for 50% off of one month of coaching that they can use or give to someone they know. The best and most effective marketing is education-based. When you provide a high-value training that relates to the topic you coach on, you develop credibility and expertise with your target audience, and are seen as a resource and “go-to” person in your niche. You attract new potential clients and grow your email list. – A good topic will address an urgent, top-of-mind problem your ideal client has. – Focus on connecting with the audience. – Make an offer about how people can move forward and take the next step with you. Challenge yourself to do a certain number of strategy sessions during the first two months of the year. If you’re not already coaching groups, consider starting one in the new year. Group coaching is an excellent way to coach with more people, including price-sensitive clients, grow your business and increase your income. It’s also a ton of fun. Plus, people like joining groups, especially in the beginning of the year. Are you excited to leverage The New Year Effect? Post your comments, questions or share your favorite strategies below! 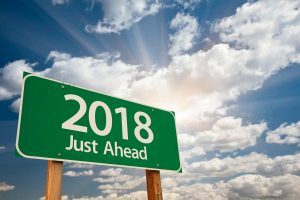 Here’s to preparing now for an amazing start to 2018!